KALAMAZOO — The real estate market is tight in southwest Michigan, because there aren’t enough buildings. The region needs additional talented workers to fill jobs. Yet Jodi Milks, vice president with Bradley Company, points to a few key events that could help the region grow even more. Kalamazoo was recently named one of Michigan’s Redevelopment Ready Communities, a certification from the Michigan Economic Development Corp. highlighting that it has removed barriers for development and will help prospective investors come to the city. The city is doing all but five of the 42 best practices outlined. At the announcement of the certification on Dec. 4, city officials touted the new website and efforts to study and woo what the city needs next. Imagine Kalamazoo 2025 began as a public project to envision the city’s future and will continue in ways that could grow and expand development. The biggest recent development underway in the region is the construction of Stryker Instruments’ 485,000 square foot facility near the city of Portage. The $154 million research and development facility could add 105 jobs to its existing 2,700 employee local workforce. Worldwide, the company has 24,000 employees, according to Southwest Michigan First, which does economic development for the region. The company broke ground on the facility in July. When tax breaks were approved in March, Portage Mayor Pete Strazdas thanked the company again for expanding in Portage. "Not every day do we have a facility of this magnitude happening in our community. We are increasing the tax base, it's a major expansion of a facility and there are a lot of quality jobs,” he said, according to Mlive.com. She’s hoping for diversification so the region can keep up with others. “We love Stryker. We love Pfizer. But we can’t depend on them,” she said, noting that Kalamazoo has lost potential tenants and owners to Grand Rapids, South Bend and Elkhart due to a lack of industrial space. “There are users who want to expand in this market and they don’t have a place to go,” she said. Land is at a premium and there is a low supply of zoned property with services such as water, sewer, and internet fiber. She believes that the time is right for a new industrial development with high bay leasable space which users may expand in over time. Milks is working through various options in order to spur local growth. “We’re not going to get an Amazon. Nor do we need one,” she said. “Our historical expansions have been more organic and grow with local developers and local businesses. We believe we can continue that trend and attract more, with the right mix of options.” she said. The region is experiencing that kind of growth, particularly as old buildings are repurposed. The former Gibson Guitar factory, which produced the iconic guitars from 1917 to 1984, is being redeveloped. 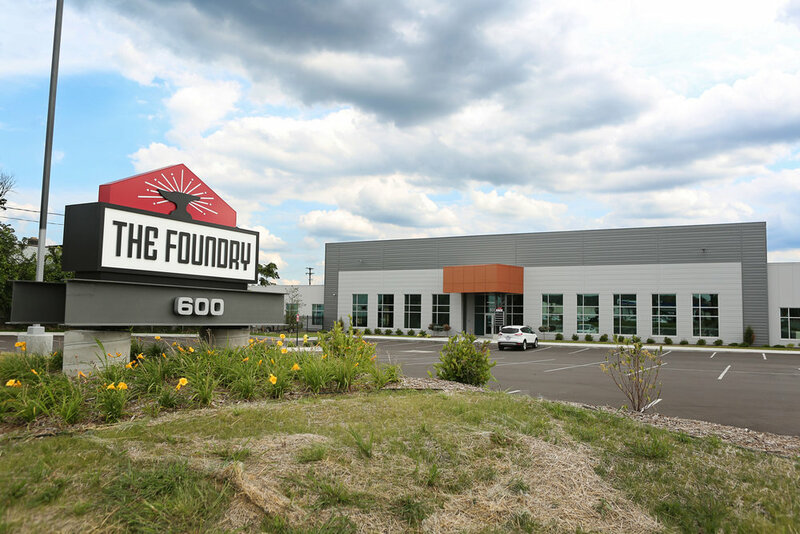 In downtown Kalamazoo, The Foundry opened in December as a hive workspace in a repurposed 53,000 square foot building. A brewery and farm to table restaurant are part of that space as well, tapping into both national and local trends, said Debby Roberts, administrative assistant in the Kalamazoo office. That $10 million investment spurs other investments, particularly from public/private partnerships, said Milks.